JUNIOR MASTER HORSEMAN - WELCOME TO JMH! Looking for more horse resources? Check out this selection of color charts, conformation charts and more! Where do you go to find horse fun for all ages? Junior Master Horseman, of course! Being a JMH'er means making friends, letting your imagination gallop wild, and learning about horses. The JMH Chapter 1 book is full of games, activities, and horse sense. Plus, it gives you access to the JMH Web site, all the interactive games and “horse talk” message board. So what are you waiting for? Grab your parent or guardian by the reins and join today. Our new JMH Teen Leader Toolkit will help you keep track of all the great work you're already doing in schools and with your local 4-H clubs. Click here to learn more today! When it comes to fun, interactive horsey curriculum for all ages, instructors probably have a difficult time finding comprehensive and scientific, yet engaging, material. Teachers, 4-H and FFA leaders, engage your students in a unique and challenging way. JMH uses vibrant characters to lead youth through lessons about horses. Learn more about Junior Master Horseman and explore our Web site. Spring brings warm weather… and those pesky flies, Zap, Zip and Zak. Test what you know about horse anatomy and chase away the bugs before they bite! Did you know that Roy Rogers' horse, “Trigger,” appeared in all 90 feature films starring this Hollywood legend? Check out this recipe for movie madness and host your own horse-crazy get-together...complete with feed pan trail mix! 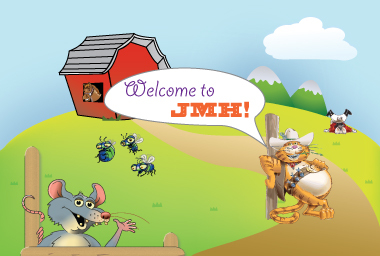 Welcome to the new JMH Web site. We hope you enjoy your visit. Tell us what you think! Register your book today and get in on all the action! Register and get access to instructor only online content.